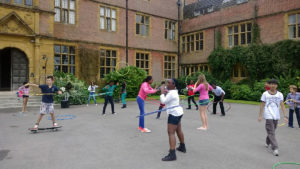 HulaFit can come to your school and teach both children and the teachers new hoop skills and games to help you all use hula hooping as an excellent way to get fit and healthy whilst having a lot of fun! We can also come for more than 1 day if you have a large school or we can bring our hoops and teachers to big school events like Sports and Family Day’s. HulaFit Hoops: The weight and size of the hoop is vital, most children and adults can’t use regular shop-bought hoops as they are too small and light! FYI – The bigger the hoop, the easier it is to use. With HulaFit hoops we find all those who have never managed to keep it up, finally can! To purchase extra hoops please enquire directly. HulaFit workshops vary in skill and difficulty, making the sessions suitable for all ages, from Year 1 to the teachers! Please note that we can create a day or programme specific to your school and needs, please contact us for more information.